One basic materials player that's starting to spike within range of triggering a near-term breakout trade is Albemarle (ALB - Get Report) , which develops, manufactures and markets engineered specialty chemicals worldwide. This stock has been under selling pressure over the last three months, with shares down by 17%. 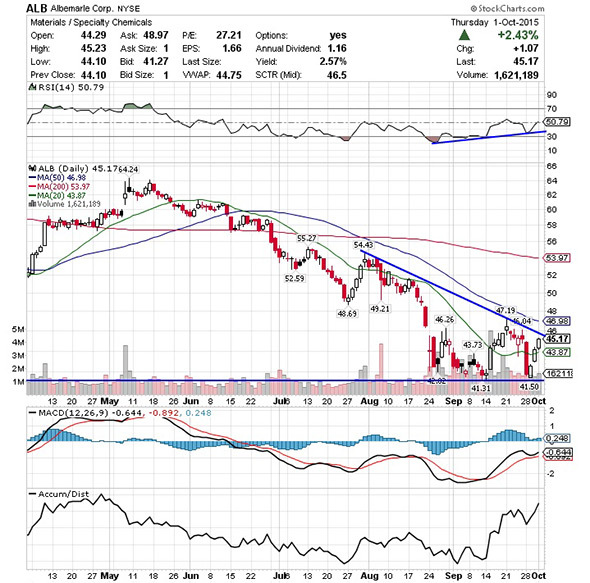 If you take a look at the chart Albemarle, you'll notice that this stock has been attempting to carve out a major bottoming chart pattern over the last month and change, with shares finding buying interest at $41.31 to $41.50 a share. Shares of Albemarle have now started to spike higher above those support levels and back above its 20-day moving average of $43.87 a share with decent upside volume flows. This spike is now quickly pushing shares of Albemarle within range of triggering a near-term breakout trade above some key overhead resistance levels. Traders should now look for long-biased trades in Albemarle if it manages to break out above some near-term overhead resistance levels at $46.04 to its 50-day moving average of $46.98 a share and then above more key resistance at $47.19 a share with high volume. Look for a sustained move or close above those levels with volume that registers near or above its three-month average action of 1.42 million shares. If that breakout gets set off soon, then this stock will set up to re-test or possibly take out its next major overhead resistance levels at $50 to $52, or even its 200-day moving average of $53.97 to $55 a share. Traders can look to buy Albemarle off weakness to anticipate that breakout and simply use a stop that sits right around its 20-day moving average of $43.97 or around $42 a share. One can also buy this stock off strength once it starts to clear those breakout levels with volume and then simply use a stop that sits a comfortable percentage from your entry point. Another stock that's starting to move within range of triggering a big trade is OvaScience (OVAS , which engages in the discovery, development and commercialization of new treatments for infertility. This stock has been destroyed by the bears over the last three months, with shares plunging sharply lower by 69.6%. If you take a glance at the chart for OvaScience, you'll notice that this stock recently gapped down sharply from over $15 to around $8 a share with massive downside volume flows. Following that move, shares of OvaScience have now started to rebound off its new 52-week low of $7.90 a share with strong upside volume flows. Volume on Thursday registered over 1.09 million shares, which is well above its three-month average action of 736,733 shares. This rebound is now quickly pushing this stock within range of triggering a big breakout trade above some key near-term overhead resistance levels. Traders should now look for long-biased trades in OvaScience if it manages to break out above Thursday's intraday high of $9.54 and then above its gap-down-day high of $10.68 a share with high volume. Look for a sustained move or close above those levels with volume that hits near or above its three-month average action of 736,733 shares. If that breakout hits soon, then this stock will set up to re-fill some of that previous gap-down-day zone that started over $15 a share. 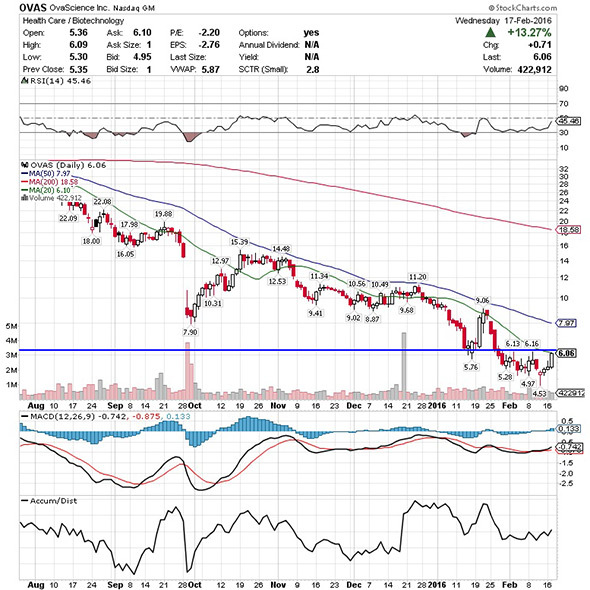 Traders can look to buy OvaScience off weakness to anticipate that breakout and simply use a stop that sits right around its new 52-week low of $7.90 a share. One could also buy this stock off strength once it starts to move back above those breakout levels with volume and then simply use a stop that sits a comfortable percentage from your entry point. 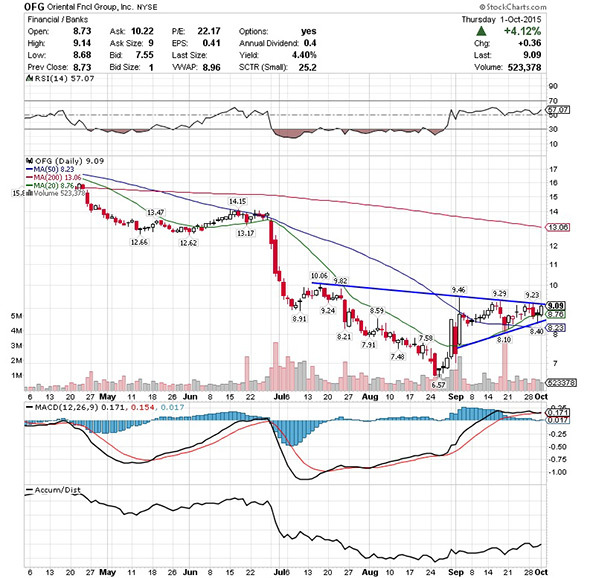 A financial stock that's starting to trend within range of triggering a major breakout trade is OFG Bancorp (OFG - Get Report) , which provides various banking and financial services primarily in Puerto Rico. This stock has been smacked lower by the sellers over the last six months, with shares off sharply by 44.8%. If you take a glance at the chart for OFG Bancorp, you'll notice that this stock has been consolidating and trending sideways over the last month and change, with shares moving between $7.50 on the downside and $9.46 on the upside. Shares of OFG Bancorp have now started to spike higher right off its 20-day moving average of $8.76 a share and right above its 50-day moving average of $8.23 a share. 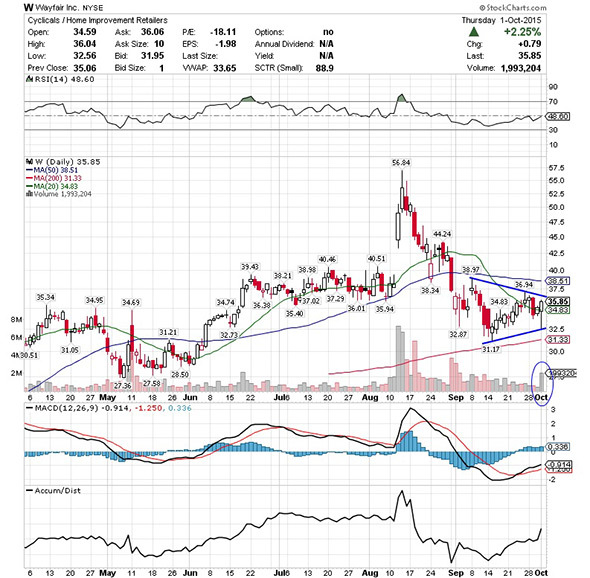 That spike is quickly pushing this stock within range of triggering a major breakout trade above the upper-end of its recent sideways trending chart pattern. Traders should now look for long-biased trades in OFG Bancorp if it manages to break out above some near-term overhead resistance levels at $9.23 to $9.26 a share and then above more key resistance levels at $9.50 to $10.06 a share with high volume. Look for a sustained move or close above those levels with volume that hits near or above its three-month average action of 940,805 shares. If that breakout triggers soon, then this stock will set up to re-test or possibly take out its next major overhead resistance levels at $11 to $12, or even its 200-day moving average of $13.06 to $14 a share. Traders can look to buy OFG Bancorp off weakness to anticipate that breakout and simply use a stop that sits right around its 50-day moving average of $8.23 or near more support at $8.10 a share. One can also buy this stock off strength once it starts to clear those breakout levels with volume and then simply use a stop that sits a comfortable percentage from your entry point. Another clinical-stage biotechnology player that's quickly moving within range of triggering a big breakout trade is Bluebird Bio (BLUE - Get Report) , which focuses on developing transformative gene therapies for severe genetic and rare diseases. This stock has been hammered lower by the bears over the last three months, with shares off large by 45%. 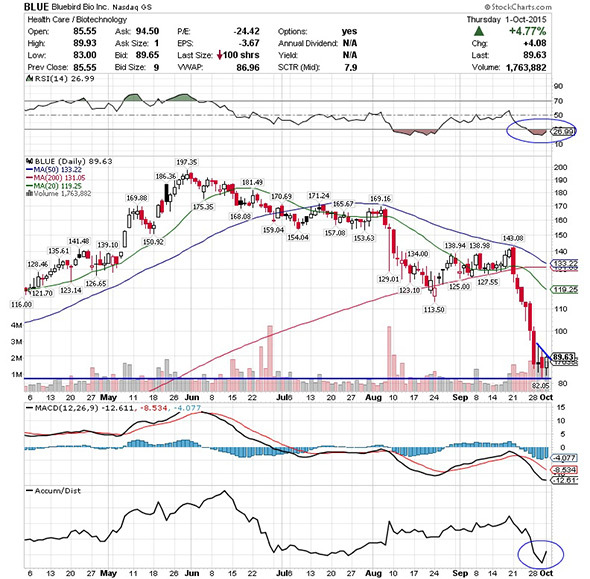 If you take a glance at the chart for Bluebird Bio, you'll notice that this stock has been downtrending badly for the last five months, with shares plunging lower off its high of $197.35 to its recent low of $82.05 a share. During that downtrend, shares of Bluebird Bio have been making mostly lower highs and lower lows, which is bearish technical price action. That move has now pushed this stock into extremely oversold territory, since its current relative strength index reading is 26.9. Shares of Bluebird Bio have now started to spike off those oversold levels with strong upside volume flows. That spike is now quickly pushing this stock within range of triggering a big breakout trade above some key near-term overhead resistance levels. Traders should now look for long-biased trades in Bluebird Bio if it manages to break out above some near-term overhead resistance levels at $92.50 to $95 a share with high volume. Look for a sustained move or close above those levels with volume that hits near or above its three-month average action of 870,550 shares. If that breakout kicks off soon, then this stock will set up to re-test or possibly take out its next major overhead resistance levels at around $100 to $110, or even $113.50 to its 20-day moving average of $119.25 a share. Traders can look to buy Bluebird Bio off weakness to anticipate that breakout and simply use a stop that sits right around Thursday's intraday low of $83 or around its recent low of $82.05 a share. One can also buy this stock off strength once it starts to trend above those breakout levels with volume and then simply use a stop that sits a comfortable percentage from your entry point. If you look at the chart for Wayfair, you'll notice that this stock has been uptrending a bit over the last few weeks, with shares moving higher from its low of $31.17 to its recent high of $36.94 a share. During that uptrend, shares of Wayfair have been making mostly higher lows and higher highs, which is bullish technical price action. Shares of Wayfair trended higher on Thursday back above its 20-day moving average of $34.83 a share with strong upside volume flows. Volume for that trading session registered over 1.9 million shares, which is well above its three-month average action of 1.30 million shares. That high-volume spike is now quickly pushing shares of Wayfair within range of triggering a big breakout trade above some key near-term overhead resistance levels. Traders should now look for long-biased trades in Wayfair if it manages to break out above some near-term overhead resistance levels at $36.94 to its 50-day moving average of $38.51 a share and then above more key resistance at $38.97 a share with high volume. Look for a sustained move or close above those levels with volume that registers near or above its three-month average action of 1.30 million shares. If that breakout develops soon, then this stock will set up to re-test or possibly take out its next major overhead resistance levels at around $42.50 to $44.24, or even $47.50 to $50 a share. Traders can look to buy shares of Wayfair off weakness to anticipate that breakout and simply use a stop that sits right around some key near-term support levels at its 200-day moving average of $31.33 to more support at $31.17 a share. One can also buy this stock off strength once it starts to bust above those breakout levels with volume and then simply use a stop that sits a conformable percentage from your entry point.